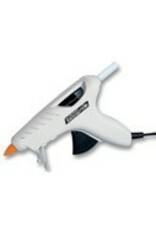 Trigger Glue Gun With Wire Stand, Takes 1/2in. Arrow Glue Stix. Features: Non- Drip Nozzle, Bonds permanently in less than 60 seconds, Safety Stand & Contoured design for perfect balance. Glue Sticks not included.